In the last week, my music collection is the most organised it’s ever been. And I’ve only now realised how important this is. For years (actually, nearly all my adult life, to be exact), I have existed in a sea of hardcopy music: music I’ve bought, music I’ve got in promo format. While my jewel-case CD collection has, for the most part, been 75% in order, I’ve never known exactly what I have. Now, I have all of my hardcopy music in order. That is, in artist order, and in release-date order (god bless Encyclopaedia Metallum!). 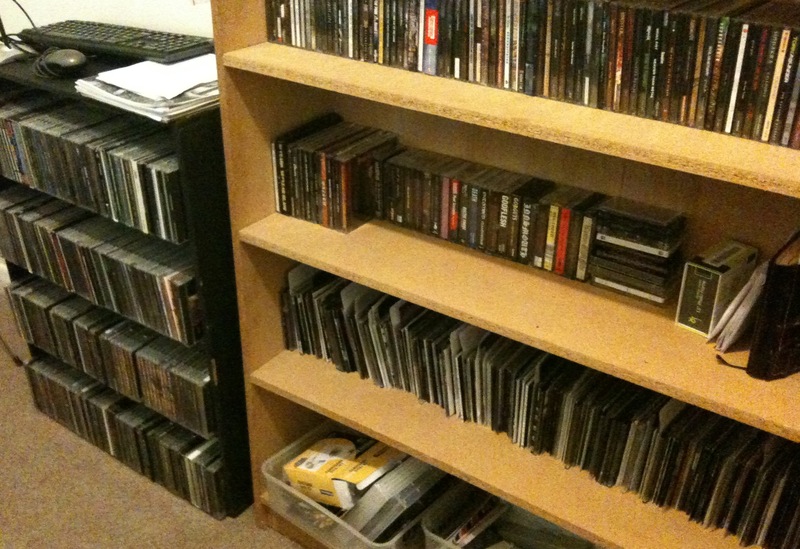 This week, I separated all my jewel-case and box-set CDs from my promo CDs, put my tapes in order, and so on. The hard work was in cataloguing every single release in a spreadsheet, which I then swiftly turned into a functional database in FileMaker. Only after every item was appropriately catalogued did I put them on my shelves. Pre-existing databases didn’t work for me, as good as they are. So I built one. I have the skills, so why not do the damn thing the way I want it? What this exercise taught me is that I have almost an equal number of jewel-case CDs and promos; and while the CDs fill something like five and a half shelves, the promos (of course, being caseless) all fit on one shelf. All 300+ of them. The second thing that this exercise taught me is that I have releases I never knew I had, that I have multiples of many releases, and in some cases have multiple promos of releases. My catalogue is organised by artist, then by title, then by format. I didn’t bother putting genres, or release dates, or labels into it, because if I want to find something, I’m going to want to find it by artist or by title. I’m not enough of a geek to go the distance with the remainder. The best thing about all of this is that now I know what I actually have!! I won’t go and buy things I wasn’t sure whether I had or not, thus ending up with multiple copies in some cases. And the wankiest (read: coolest) thing about it is that now I know exactly how many discs I actually have. It’s not bad, really, considering how many releases I wish I had. It’s over 700. What about you? How does your music collection look? Started organizing mine a few weeks ago. I got up to “D” and ran out of shelf space, so the project is on hold until I can make an IKEA run. I don’t know what it is that’s so satisfying about having all my music in precise order, but damn is it satisfying. Also makes it easier to listen to an actual disc rather than just relying on iTunes all the time, which is nice because I’m trying to go back to listening to albums in their entirety all the time, like I used to back in the pre-PC days, rather than just having a playlist on random. Yes, me too. I utterly dislike MP3s, I’ve decided, apart from their portability. There’s something so lovely about listening to actual albums, going through a collection, and taking your time to choose something. Also, since moving house, heaps of my listening is on vinyl again. And that is fabulous.